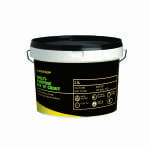 MPFNG 2.5LTaking this into consideration, Dunlop, specialist manufacturer of tile adhesives, grouts, finishing and ancillary products, is predicting that its Multi-Purpose Fix ‘N’ Grout will be a big hit within the trade. The product is an all-in-one, ready-mixed adhesive and grout, specially formulated for fixing ceramic or mosaic wall tiles in showers, bathrooms, toilet areas and kitchens. The superb non-slip characteristics of Fix ‘N’ Grout mean that the need for battens is reduced, while its dual purpose capabilities mean that it can also be used solely as an adhesive in power showers if a suitable grout is used, reducing the need for several different products. Debi Boulton, Brand Manager at Dunlop, commented: We have been working with Fix ‘N’ Grout for a few years now to provide efficient and dual purpose tiling solutions, giving tradesmen the very best offering on the market. The product’s dual purpose reduces the need for more than one product, and its non-slip formula means battens aren’t required. Anything that can save a bit of time and effort is always a winner in my eyes!